This East Lancs bodied Dennis Dominator spent more years in Warrington than its native city of Leicester. The East Lancs bodywork styling superseded the traditional box shape applied to Leicester's previous batches of Dominators but the thin body sides and square gasket glazed windows meant that body movement soon resulted in excessive water ingress. C100UBC is part of the Leicester Transport Heritage Trust collection (see http://www.ltht.org.uk/). The Trust owns four ex Leicester City Transport buses, but the Trust's current membership can muster a further 15 vehicles ranging from 1950 to 1982, and all of these have connection with Leicester and the County. Indeed, this Dominator is privately owned by Andrew Harris but considered as part of the LTHT collection. 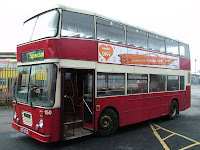 The bus is to be partly repanelled and all glazing rubbers replaced prior to a complete repaint back into mid-1980s Leicester livery of red, light grey and white.